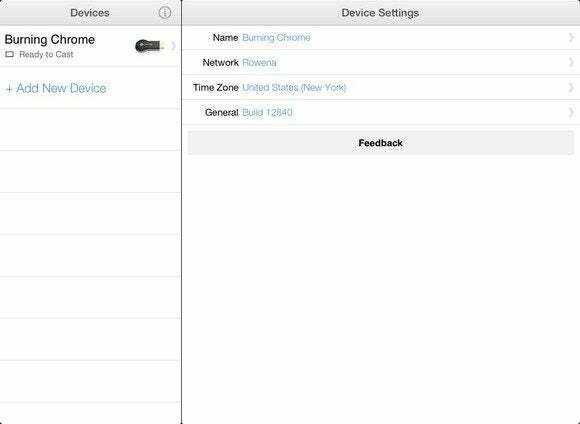 Google would like you to know that you’re not just limited to setting up your shiny new Chromecast via your laptop—if you have an iPhone, iPad, or iPod touch, you can now hook up or manage your Chromecast directly from an iOS device, thanks to a new free Chromecast app from Google. The app itself is pretty simple: At startup, it’ll scan your network for existing Chromecasts, displaying a list of the devices that it finds. If it can’t find any, you have the option to set up a new Chromecast; you can also add a new device from the screen listing what we’re sure are all of your many existing Chromecasts. Strangely, tapping the YouTube and Netflix buttons takes you to the App Store instead of the apps on your device. For each individual device, you can view a handful of settings, including the device’s name (which you can edit), it’s current network and IP address, the current time zone, and the current software build. The latter options let you change the device’s time zone and provide automatic diagnostic data, respectively—you can also reboot or reset the device from the General screen. There’s also a button to provide feedback directly from the app. Perhaps the strangest of “features” in the app is the invitation to cast video from two popular apps, YouTube and Netflix. Tapping either of those icons takes you to the respective app’s entry in the App Store—regardless of whether or not you have the app already installed on your device, as I did—but perhaps it’s intended more as an advertisement for Chromecast integration than for actual utility.